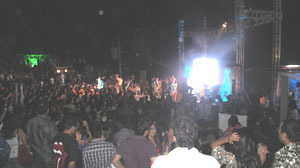 The fourth edition of Sulafest held at Sula Vineyards last Saturday may be miniscule compared to Woodstock but over 3000 young people thronged the amphitheatre to enjoy an interesting day, away from the humdrum of a big city like Mumbai, although people from Pune, Nashik and as far as Delhi also enjoyed a day of wine, food, music and bonhomie, writes Subhash Arora who feels that events like this can be big wine promoters. At Rs.800 a ticket, just for the entrance charge for an event, about 15 kms from the Nashik city center and around 200 kms from Mumbai, one would think there would not be many takers. But the ‘Sold Out’ board at the entrance of the vineyard early in the afternoon of February 6 was an indication of the success that would later result in traffic jam around the vineyard both at the entry and exit. It is a compliment to the organisers and the visitors that there were no incidents of misbehaviour, with the crowd completely letting the hair down. There were a couple of bars selling Sula wines by the glass at the Tasting room prices. Several food stalls had been set up and despite fears of a shortage of food; wine would never be a problem, assured Rajeev Samant, the stalls were continuously being replenished with food. Distributed by Sula, Cointreau was the only non wine/beer beverage that the Cointreauversial stall making Cosmopolitans, seemed to use. It was so popular that the 48 bottles brought in for the evening were finished much earlier. Asahi beer also being imported by Sula was very popular at Rs.150 a pint whereas the diehards were happy with the Kingfisher at Rs.100. The popular rock bands had started belting out foot-tapping music since the afternoon and for the young visitors from Mumbai that might have been the key attraction besides some of their favourite wines from Sula. The usual side attractions at such fests like foot message, a local bazaar, tarot card reader etc were also providing entertainment. The two restaurants at the vineyard-Little Italy and Soma had been converted into VIP lounge where one could breathe easier-several closed-circuit TVs here and all around the venue transported the music visually. You don't buy a Bournville; you earn it, say the Cadbury ads on TV and other media. Being the main sponsors, they had earned the right to have their chocolates matched with Sula wines, courtesy Cecilia Oldne, their international manager. Whether you earned it or not, you could buy the choco-wine paired combos against coupons, the trading currency for the day. Sunila Duggal, the marketing manager and chief organiser for the Sulafest for third year, looked stressed with a walkie-talkie set that seemed to be overused. ‘I am not stressed, I just want to make sure there are no mishaps-especially as we are really crowded this time.’ She was also the reason why the ‘house-full’ sign had to be posted. 'Besides advertising through our PR and advertisements and hoardings, we used social media to promote the event,’ she said. 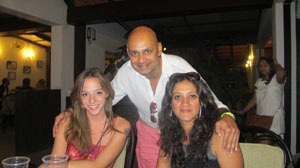 Cecilia Oldne, was at her best assisting Sunila to make sure time moved smoothly. She had earlier done a good job in motivating journalists and other opinion makers to come and enjoy a day at the vineyard. Ask anyone about the biggest strength of Sula being the leader of the Indian wine industry, the unanimous answer would be Rajeev Samant, though many attribute the rise of Sula to have been made easier due to the downfall of Indage, the previous leader. Undoubtedly, he is the biggest brand ambassador and implements new ideas conceptualized from California, much ahead of others. 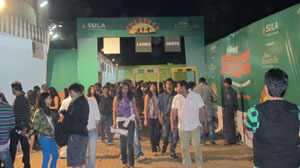 Sulafest was a creation to help promote the branding of Sula and one could see that he has been quite successful. Other producers don’t mind accepting this as a benchmark and emulating him; York Winery is organising a similar event on February 26 and calling it York Live. This year’s number was around 3000, almost double of last year. At this rate, next year would have the possibility of 5000, attending. Again, nowhere near Woodstock, but for those attending it, a must-visit in the calendar. While Duggal did not like it to be referred as a music fest and thought it would be disastrous to think that number, you could bet your sweet Sula Late Harvest Chenin Blanc that Rajeev was already thinking how to make it bigger and more successful next year.